Summer weather is long gone across many parts of the country, which means you wont find yourself reading while sailing around on a yacht anytime soon like the woman pictured at the top of this post. There’s a killer sale right now on Amazon though, so it’s the perfect time to prepare yourself for next summer, your next vacation, or simply to upgrade your old eBook reader. 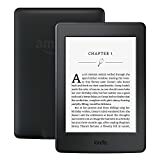 For a limited time, Amazon has slashed an extra $20 off the price of the Certified Refurbished Kindle Paperwhite E-reader as well as $15 off the price of the Certified Refurbished Kindle E-reader. Definitely grab one while you can!